I don't usually review quiz books because do you actually read them? Not from A-Z or in one sitting at least. 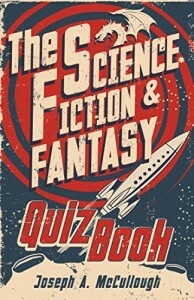 However, when I was browsing Netgalley I was intrigued by this particular one and secretly I also wanted to know where I stood on my science fiction and fantasy trivia. The questions are divided into three categories, ranging from easy to hard. And although the questions in general indeed seemed harder in the more difficult categories, I think it really depends on whether or not you're familiar with a certain book/series/world. The questions were a great mix between old and new, books, movies/tv and games. There were different sort of quizzes like multiple choice, false/true and open questions. Every so often there was a themed match something to something else quiz.